Six-time Australian V8 Supercar champion Jamie Whincup had a media outing at the Taronga Zoo in Sydney to announce that Red Bull Racing had re-signed him for another three years. 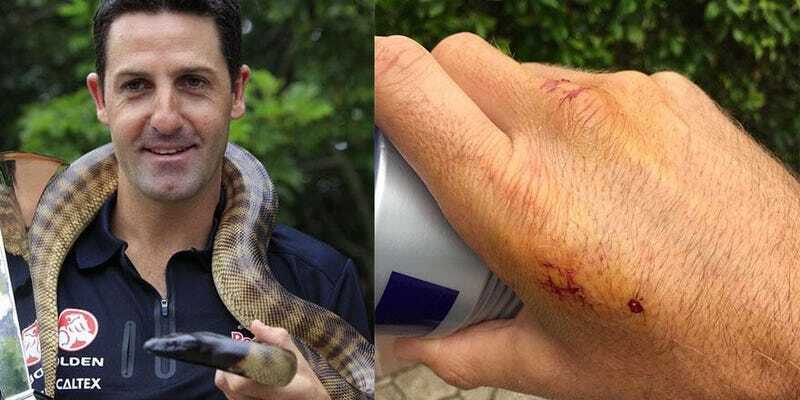 Of course, they tried getting photos of Whincup, his trophy and a black-headed python. Oops, that backfired. Whincup has been the V8 Supercar champion for the past four years, so it only makes sense for his Holden team to resign him. Of course, because it's a team sponsored by Red Bull, I suppose he's lucky only got bitten by a snake as opposed to thrown out of an airplane/made to wrestle a bear/forced to interact with over-caffeinated children. Everyone knows Australia is the home of many, many things in nature that just want to kill you, so I guess this is just one of the perils of driving a V8 Supercar: press events. Press events with angry snakes. Fortunately, Whincup does not believe the injury will prevent him from driving a V8 Supercar. Let's be honest, though, Whincup could probably drive with his nose and still be at least mid-field.